Exciting fist-in-glove duet playing of Irish traditional music on two flutes and tinwhistles--driving and powerful, with guest Dennis Cahill on guitar. "In the summer of 2002, the two of us sat down for a few tunes in McKenna's of East Durham, New York. We really enjoyed ourselves that night. Two flutes together can create a musical spontaneity and a rhythmic back-and-forth that is about as wild as you can get in Irish music. We wanted the music on this recording to sound as much like the way we played that night as possible. The flutes were recorded over a couple of afternoons, with no edits, no overdubs, and no prisoners taken! Here is the full package, with flutes going, feet pounding, and air breathed. We hope you enjoy listening. Great album! Some of the most muscular ITRAD flute music I've heard. I love the recording quality of this album too--hearing the foot stomping and the breaths inbetween notes makes you feel like you're at a great session. Irish flute and whistle played with skill and abandon. For some unknown reason, if you are a flute player all of these tunes really fit the flute well. Hmmmm.... coincidence-- I think not! Fun stuff and well arranged. Heard it on Robbie Hannan's program on radio Ulster - kept reloading the page to hear the reels he played again and again! Same here - cause this is not in Ireland yet! Get yer fingers out and release it here!!!!! Far better than some other more prominent releases I've heard this year. this is a fine and well-developed album that adheres to a keep-it-simple formula that works fantastically. overproduction is certainly the death of much of irish and celtic music. this one has the sense of sitting in the kitchen and listening to friends play. very subtle shading by dennis cahill. everything from the players to the accompaniment supports the tunes. delightful. went to ireland for the first time back in 1993. my background is Irish, but had little grounding in the culture, let alone the music. once in the country, i went out of my way to find the music being played. the instruments on this CD were what most touched me during this trip. for lack of a better way to say it they made feel as if i'd come home. without knowing this would happen the reels, the Irish whistle, music similar to that on this CD resonated with my soul. during work hours i listen often to a celtic radio channel i can get from the internet. one of the songs from this CD played and i could not help myself - AND I DO NOT OFTEN purchace anything on the internet - i ordered the CD immdeiately. i love it. it is everything i hoped for. i can get lost in the music. it makes me want to dance. it resonates with some deep Irish part of me. the quality, the selection, the length are all perfect. Best 2 people session ever! This has got to be the best 2 people session every played and recorded. Took a lesson with John - he was great then and he is greater now with Kieran at his side. Get it! Wow! Terrific CD, great players. 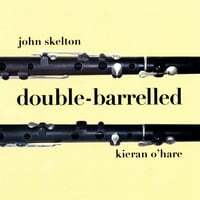 I first heard John Skelton on an old LP recorded in 1980 (Shegui, a band that included the great Irish singer Sean Keane). Never heard of Kieran Hare. But the tunes on this great CD reminds me of dozens of sessions here and in Ireland. Both men are superb flute players--their solo tracks are lovely and they clearly know each other well enough to play a slew of close duets. Great accompaniment, just right to accent the flutes and whistles. This album made me want to do things with a flute that I've never done before. This recording is absolutely brilliant! The music on this album is alive and intense, not to mention engaging, fiercely traditional, and above all, masterfully conveyed. Whether you’re a scrupulous connoisseur searching for the crowning jewel of your flute CD collection or simply interested in superlative traditional Irish music, this recording can be appreciated by all…and for the literate, the liner notes are dryer than Oscar Wilde! So dear reader, if you lack the unmitigated temerity to disagree with the aforementioned remarks, purchase Double-Barrelled, sequester yourself in a quiet listening space, and appreciate great music played by two of the tradition’s most ineffably adept exponents. Fanastic flute music--both individually and as a duet! It has been a long time since I heard an album of two identical instruments sound even nearly this good. There is no "hiding" in this sort of arrangement...which requires the voicing and interpretations to be deadly accurate and /or complimentary. This cd will satisfy those who like to scrutinize such things.....but much more importantly, it is delightful, soulful playing...in short, brilliant music. From the tune selection to the pacing and phrasing...all first class. Congratulations Kieran and John. When cometh the next one? ?